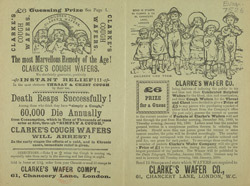 This is an advertisment for Clarke's cough wafers. ‘Cure all’ medicines were very common in the 19th century. They contained undisclosed ingredients and advertising campaigns persuaded many members of the public that all their ills would be cured if they consumed their product. Because the ingredients were a secret, the druggists and manufacturers could add anything to their mixtures and often they were not medicinal at all but were sugary liquids containing food dyes. It was not until 1909 that the British Medical Association attempted to discredit these medicines by publishing a list of all medicines and their ingredients.